Discussion in 'General Discussion' started by Greg Nixon, Apr 9, 2019. Magnuson and Rando like this. I could not have asked for a better line-up this week! I am beyond overjoyed at this! I finally can get a GF─perhaps two! I have Snow Maiden in the mix as well, so that's my 500%. And it all starts on my birthday─tomorrow. This is a lovely present if I say so myself! Platty, jeosiri, Magnuson and 4 others like this. I have one frost and one snow maiden. 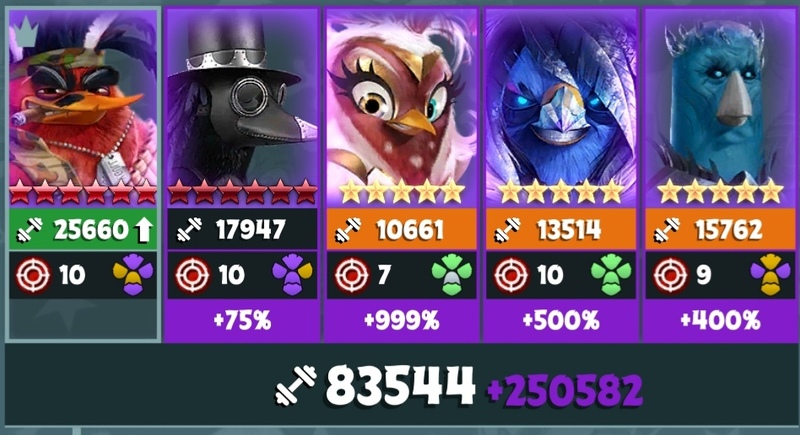 I think I make it to lvl 85 so I get a Master frost I don't know if I should try to hatch a second Snow maiden and a third frost because of the awaken Feature. Or wait for the hopefully new easter bird. Good for prestige totem stocking up to say the least. Not sure about the team yet and it may not be a complete autoplay event either as Annie SS need proper timings. And blue birds get blocked. Silver tickets (180+) and 10 + 2 gold also. Gold tickets should last til next week I think. I know I have 1 Master Annie from last time, 2 GF at least, and at least 1 Marisha. More power vs more practical. My Master Marisha is less than lvl 100, won't be use. I have 1 more GF but weaker. Matilda will be disappointing this event... many better options. ELLY and Rando like this. Monty Topple, Magnuson and Rando like this. Zain with the plague mask evo is known for "round winning kill" even against the biggest pig, in 1 hit. Wow, I had no idea. I'll have to make sure to get him next time. I have GF and Master Annie. I think I'm going to hatch Snow Maiden. Is she worth it? The consensus seems to be that she wouldn't be worth it. She'd be good for a starter 5* bird, as she can heal depending on her combo hits, though. She is underwhelming for sure. Snow Maiden is basically an upgraded Trey, if you think about it. for me, snow maiden is the missing 5* to awaken M. GFF, so well worth it. I plan to hatch and keep the regular GFF at L80 SS1 anyway (for a very specific reason). pretty sure I won't bother with M. Annie unless I hatch early the first two birds. I'm pretty sure I'll get the M. GFF easily.